The Barclays Premier League (BPL, and sometimes referred to as the EPL – English Premier League – outside of the United Kingdom) launched in 1992, and quickly became the world’s most popular sports league. Consisting of 20 teams, each club plays their opponents twice in a season, one match home and the other one away, equaling 38 matches during the course of the entire season that runs from August through May. Unlike many other European club leagues, the Premier League has no winter break and continues every week throughout the season except when there’s a FIFA-mandated international break when many players from the Premier League will play for their respective countries in international games such as friendlies or qualification games for the World Cup or European Championship, and other regional competitions. The main attractions of the Premier League are the vast number of world-class players, the different soccer styles among most teams, and the often noisy crowds up and down England and Wales. Many of the Premier League games feature unpredictable outcomes, where it’s often very difficult to predict where the clubs will finish in the standings (aka league table), as opposed to other leagues such as Spain where the top two teams (Barcelona and Real Madrid) always seem to win every week. The Premier League teams that finish in the bottom three of the standings each season are relegated to the second tier of English soccer, known as the Championship. The top four teams qualify for the UEFA Champions League, which is the most high-profile club soccer tournament in the world featuring the best teams from Europe competing against each other from the group stages (in September) through to the final in May. The top four teams qualify for the Champions League, although the fourth placed team must compete in the Champions League play-off (beginning in August) to qualify for the group stage. The fifth-placed team in the Premier League automatically qualifies for the UEFA Europa League, and the sixth and seventh-placed teams can also qualify, depending on the winners and runners-up of the two domestic competitions (FA Cup and League Cup); if the winner of the FA Cup qualifies for the Champions League, then that place will go to the runner-up, and if the runner-up is also already qualified, then that place will go to the next-best placed finisher in the Premier League. If the winner of the League Cup has already qualified, that place goes to the next-best placed team in the league. 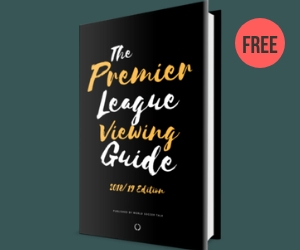 SEE MORE — Where and how to watch Premier League streams. A further place in the UEFA Europa League is also available via the Fair Play initiative. If the Premier League has one of the three highest Fair Play rankings in Europe (based on how few yellow cards or red cards each team receives, as well as the behavior of its supporters), the highest ranked team in the Premier League Fair Play standings that has not already qualified for Europe will automatically qualify for the UEFA Europa League first qualifying round (that typically begins in July). SPECIAL OFFER: With DISH Network, get NBCSN, beIN SPORTS, beIN SPORTS en Español, ESPN, ESPN2, FOX Sports 1, FOX Sports 2, Univision Deportes and more. DISH Network is offering 290+ channels starting for $89.99/month, and you’ll get a free HD DVR and free voice remote. Get the details on the offer or call 855-389-9730 today. How to pick an English Premier League team. Everything you need to know about NBC’s coverage of the Premier League. Premier League TV and Internet schedule. 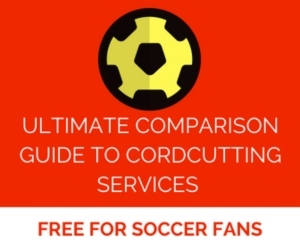 Ultimate guide to soccer books. Ultimate guide to the best soccer movies. Browse through the Premier League shirts. How come Leicester city is not on the list ? The guide is from last season. American footballs are brown with white laces. American baseball’s are always white with red lace. How are the premier league decide what color, style? Do the clubs need to approve on the ball color. Sorry for the trivial question. Sponsorship essentially. Adidas or similar will provide the ball with a new design every season. When football was first televised by the BBC in the 1930’s, footballs were dark and difficult to see. In response to complaints, the FA changed their colour to the familiar white with contrasting black spots. To this day, predominantly white footballs with contrasting darker patterns are the standard at all levels of English football. However, from late October to the end of February, the Premier League uses “high-visibility” coloured footballs… in recent seasons, predominantly bright yellow… for extra visibility in dark, rainy, foggy and snowy conditions for players, spectators and colour television viewers. What are Category A tickets for a football game? Great question. Those are typically the matches against some of the biggest teams in the league, so those are always more expensive tickets than a ticket against a team lower down the league. Which teams play the finals? Is it the top 2 teams or semi- finals decide it? Win the Premier League? The team that finishes with the most number of points over the 38 games in the season (3 points for a win, 1 for a draw and zero for a loss). So essentially you can know who the winner is before the last games of the season by who has the most points? Especially if one team has a big lead? Yes. The winner is usually decided in the last 1-2 weeks of the season, but there have been times when teams have won it as many as 4-5 weeks before the season has ended. There have also been times when the season has been won with literally the last kick of the game on the final day of the season. I know all about the goings on in the premire league……..But unsure how many clubs from the division below come upto the premire is it the top 3 clubs…..as bottom 3 clubs get relegated from the premire…….I’m I wrong? Could it be top 4 clubs that go up2 the premire? Anyone? Help me out here? Three clubs get promoted from the Championship, which is the league underneath the Premier League. Those 3 clubs replace the 3 that are relegated from the Premier League. From the Championship, the top 2 clubs get promoted automatically. Then the clubs that are in positions 3 through 6 go into a playoff to determine who is the third and final team to be promoted. The final of that competition is the richest-ever soccer game in history. The value to the winner of the Championship Playoff Final is approximately $250 million. Why do the winners of the 3rd place team in the lower league win the most money ($250M)? That means at present they would be ranked roughly 20th in Premier. Seems strange to me that a 20th place team would win so much. Oops. I misread the sentence that said “the second tier of English soccer, known as the Championship”. It’s not that Champions is a lower league. It’s “Championship”. Confusing. Ok, so the top 3 teams from the EPL go on to play in Champions League. The bottom 3 to go “English League Championship”. And the Champions League has teams from all of Europe play, which is why it’s worth $250M to win it and highly popular. It’s the chance to make history continent-wide against top notch players from other leagues nearby (although, you lose a bit of the domestic rivalry factor). Hi Nate, yes, it’s confusing. The first division is the Premier League. The second division is the Championship. The third division is League One. The fourth division is League Two. Clubs can be relegated and promoted between each of these leagues. The playoff game in the Championship to determine which team will be the third team promoted from the Championship to the Premier League is worth an estimated $250 million in value, not in prize money. The $250 million estimate is based on TV revenue and potential sponsorship deals that the team can generate in the Premier League. Out of interest, the winning team for the 2016/17 UEFA Champions League will receive $16.4 million. But they’ll also receive a considerable amount of money from the revenue generated from TV rights. The final number they generate is based on which league they’re in and other factors. For the Champions League, the top 3 teams in the Premier League for the season that ends in May automatically qualify into the Group Stage that begins in September. The fourth placed team in the Premier League has to go through a qualification round in order to try to make it into the Group Stage of the tournament. The three clubs that finish the Premier League season with the least number of points (the bottom three) get relegated to the Championship. A newby to soccer and I have a “?”. I’am looking at team standings on a English website. a letter P = games played. then the letters GD, what do these letters stand for? The third letters are pnt. I know those letters. GD has me stimied. Ca you help me. Goal difference. The number of goals they scored minus the number of goals they conceded. Newbie – if a team wins the EFL and qualifies for the 3rd round of the Europa league, but also qualifies for the Champions League then what happens? Hi Dennis, I’ve been thinking about this question, but I’m a bit confused by it since I don’t know exactly what you’re asking, but I’ll do my best to explain. The EFL is different than the EPL. The EFL (English Football League) contains the 72 teams in England/Wales in the second, third and fourth tiers. The EPL (English Premier League) contains the 20 Premier League teams in the top division. Regarding Europe, a team can’t qualify for both competitions in the same season. But if they’re in the 3rd round of the Europa League, that’s typically around December to February (depending on what you consider the 3rd Round since there is technically no round named the 3rd Round). But even if they’re in a UEFA Champions League position at that time in the Premier League, they can’t guarantee qualification until the end of the season and will then play in the Champions League in September. It does get a bit confusing, but hopefully that helps a little. If you have any follow-up questions, feel free to post them below. Thanks. If a team qualifies to both CL and EL (for example by winning the BPL and FA Cup), they play in the next season in CL, but next team in League (8th as 5th, 6th and 7th already are qualified) takes it’s place. If additionally the same club win EL or CL previous seasons, whole thing moves one team down and there are 5 CL teams and 9th team qualifies to EL too. Round they start depends on UEFA point club has (if it never played in CL/EL it has 0 and start almost from the “bottom” of qualifications). What do the letters on the league table mean, and how do they calculate the team standings? The team standings are ranked from the club with the most number of points to the fewest (3 points for a win, 1 for a draw and 0 for a loss). If teams have the same number of points, they’re ranked by the team has the biggest positive goal difference. Question – has it ever happened that a team which has won the Premier League one season, falls to the second league the next season? Not in the Premier League. But in the top division (well before it became the Premier League), Manchester City won the title in the 1936/37 season but then got relegated in 1938. The teams that finish in the three bottom positions (20th, 19th and 18th) at the end of the season are relegated to the Championship. Just want to say thank you for all the great information. Now if you can try to break down contracts, as in the loaning of players and the like. Watching today as Sunderland clinched relegation, and was only half awake during the pregame. Did I hear them say that they lose their players that are on loan? Are there rules that effect contracts when being relegated. Thanks again. Loans are usually for a few months, half a season or the whole season. Each loan is different. And it’s likely that the clubs who loaned players out to Sunderland will want them back at their clubs at the end of the season. This is a personal choice for the supporter. Some would prefer their team to win the Premier League while some want their team to win the Champions League. Most want both. The Champions League is played between the top teams around Europe so the worlds best players are playing against each other. The Premier League is England’s national league and although the league is full of top players not all the best players play in England. I am requesting you to tell me how do I join the clubs of the Premier League. Please, kindly tell me the steps to do what next. I am Rafsan from another country, I am 13 years old with lots of achievements. In football, I have great pace, power shot ability, well passing and crossing, well dribbling, well agility, dodges and fakes, etc. I am quite famous in Inter School Championship, then all sorts of football tournaments. I am 5.5 inch tall with a muscular body and weight= 48kilogram. I would grandly like to know that how do I join the clubs of Premier League. Please kindly tell me the steps. I am very much interested in Premier League though I am from another country. I know somewhat of joining these clubs. First of all, I need to come to England. Then my question is what should I do next? I am 13 years old. So, should I join a academy or I should join the 4th division(League 2), 3rd division(League 1) or …. Please guide me, please suggest me the best thing you can. Please clarify my concept.